Pitt Admissions tweeted regarding student activism. Students applying to Pitt will not be punished for participating in peaceful protests following the mass shooting in Parkland, Florida, the University said on Twitter. The Pitt Admissions Twitter account first released the statement in response to the #ParklandStudentsSpeak movement. 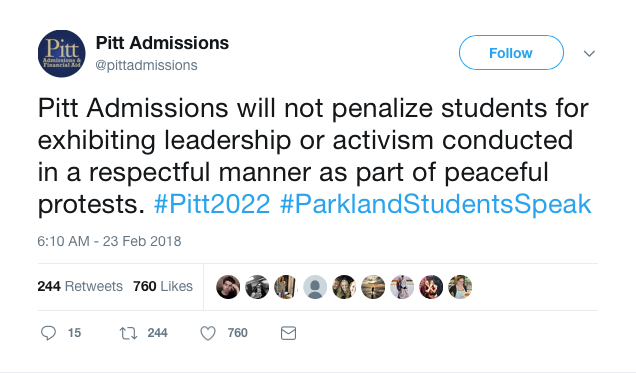 “Pitt Admissions will not penalize students for exhibiting leadership or activism conducted in a respectful manner as part of peaceful protests. #Pitt2022 #ParklandStudentsSpeak,” Pitt wrote in a tweet. Pitt’s tweet comes in response to a movement organized by the students at Marjory Stoneman Douglas High School. High school students across the country are organizing schools walkouts in protest of gun violence and a lack of government action following the Parkland mass shooting Feb. 14, where 14 students and 3 teachers were killed by a former student armed with an AR-15 rifle. Pitt isn’t the only university to address the activism prospective students might be participating in. Other Pennsylvania universities that have released similar statements include Bucknell, Temple and Penn State. Across the country, schools such as University of Connecticut, Brown University and University of California Los Angeles have also released statements regarding admission for students. A Pitt spokesperson didn’t respond to questions in time for publication.